depending on your level of development and personal goals." 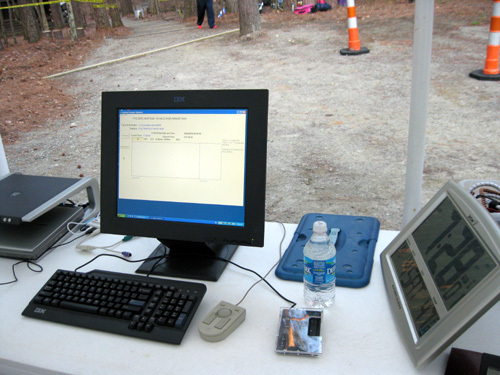 This event has become very popular after fifteen years of excellent organization by race management, dedicated service to the runners by its volunteers, fast times recorded by many of the runners, and the rolling, scenic terrain at Umstead State Park. If you have any inkling of a desire to participate early each April, you have to be alert the previous August or September for the notice re: when on-line registration begins. Miss it by a few minutes, or get a mailed registration in too late, and you're probably SOL for another year. The on-line allotment of entries filled in something like 19 minutes this year. Some slots are also reserved for mail-in applications, which is a nice feature for those who can't be on-line at the exact, correct time for some reason. 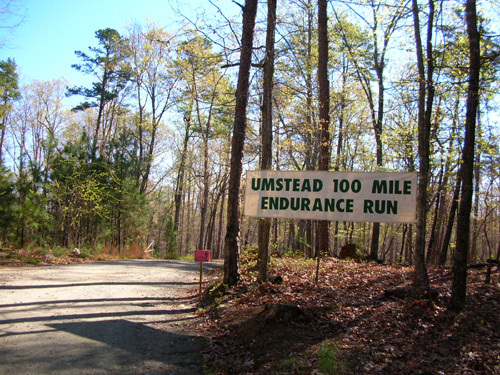 Each time we have registered (seven months in advance) for Umstead we have had the intention of running a hundred miles there. But a lot can happen in your life and training in seven months, so one of the beauties of this race is getting credit for a 50-mile finish for any distance you run over 50 miles if you change your mind before or during the race. That's what happened with Jim again this year. When he registered last summer he had no real firm idea of what other races he wanted to run this year. By January, he decided to run the Bighorn 100 again in June. In February, he added the Tahoe Rim Trail 100 in July to his list. Running 100 miles at Umstead wasn't out of the question, but it was questionable how it would affect his summer hundreds. So he pretty much decided in the days and weeks prior to Umstead that he'd benefit more at Bighorn from a faster-paced 50-miler in April as a training run than wearing himself out by going the full distance at a slower pace. Still, he packed enough gear and supplies in his running boxes to do the hundred, just in case he was having a great run! 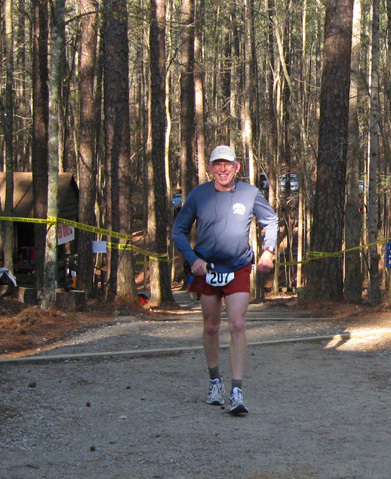 "The Umstead 100 Mile Endurance Run is designed with several basic concepts in mind. It will help new ultra runners to bridge the quantum leap from 50 mile runs to the mountainous and more rigorous demands of most 100 mile endurance runs. It will allow those runners who have difficulty finishing 100 miles in 24 hours or just finishing 100 miles the opportunity to do so when severe topography, heat, and getting lost are removed as major obstacles. 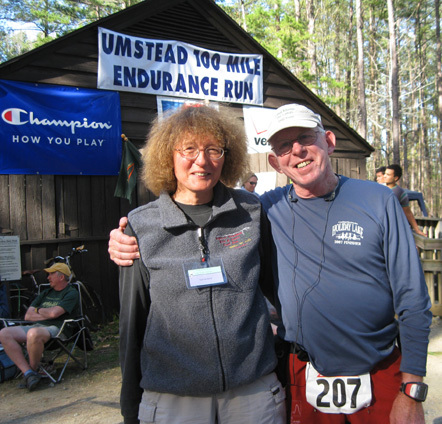 Many runners will find the Umstead 100 to be an excellent preparatory run for the Massanutten 100, Western States 100, Leadville 100, Mohican 100, Wasatch 100, Vermont 100 and other 100-mile mountain runs . 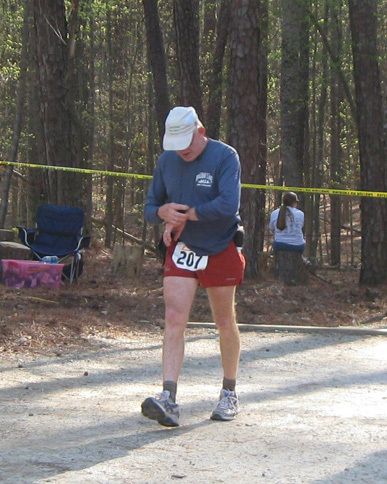 . ."
Before Jim and I ever set foot on the Umstead course in 2007 we had the mistaken notion that it was flat and easy. It is relatively easy, in comparison with many of the other trail 100-milers in this country, but it is by no means flat. That's good, though. The constant rolling hills and 16,000 feet of total elevation gain and loss keep runners from using the same muscles over and over. Front runners can run every step of this course. Those of us who are slower like having an excuse to walk up hills and then run down the other side. The footing is excellent, especially for klutzy runners like me. The only place to trip is on the approach hill to the start-finish-turn-around area at Camp Lapihio. The rest of the multi-use roads/trails used in the race are 10-15 feet wide and covered in finely-crushed granite. Many runners wear road shoes instead of heavier trail shoes. Creek crossings are on bridges. In a rainy year there is potential for some mud and puddles but nothing like the recent MS 50 we ran. 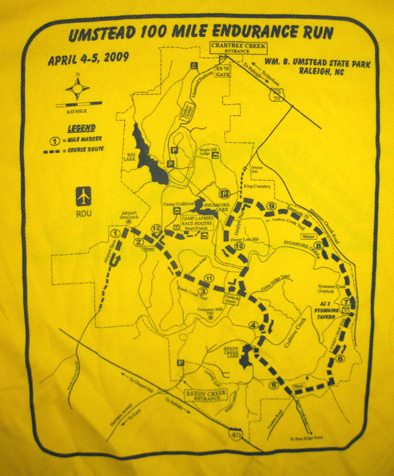 I don't have very many pictures of the course from this year's race but you can see quite a few in the 2007 Umstead album at our Picasa photo-sharing site. The three photos above are from that year. A hundred miles is never easy, though. 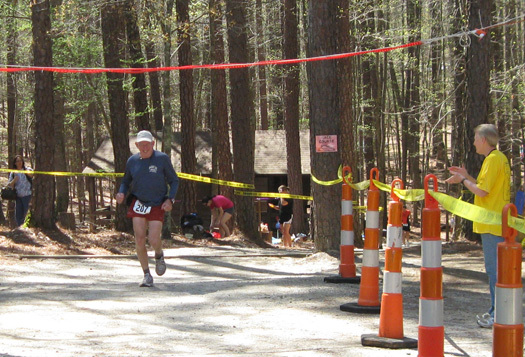 And a loop course like Umstead makes it more difficult mentally for some runners to continue on past the 50-mile mark. It's a little less tedious than it used to be when the race consisted of ten 10-mile loops. Now it's eight 12.5-mile loops with a little out-and-back spur past the airport each time. Compared to a point-to-point, out-and-back, or one-loop course, it still takes some extra determination to turn around and go back out on the loop each time a runner finishes a lap. Those loops are advantageous in some ways, however. There is little to no chance of getting lost, even at night, because runners can memorize the few turns (the course is also very well marked). Runners have access to their drop bags and/or crews twice every loop. Crews really aren't necessary. 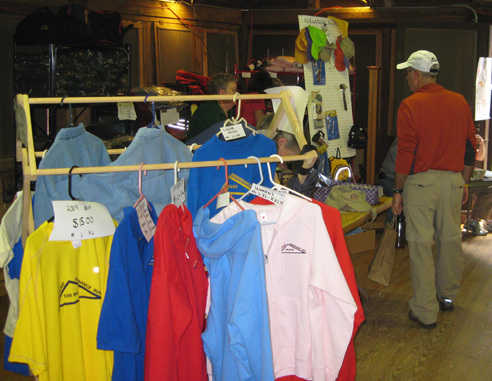 It's convenient to access clothing, lights, and other gear and supplies as conditions change during the race. 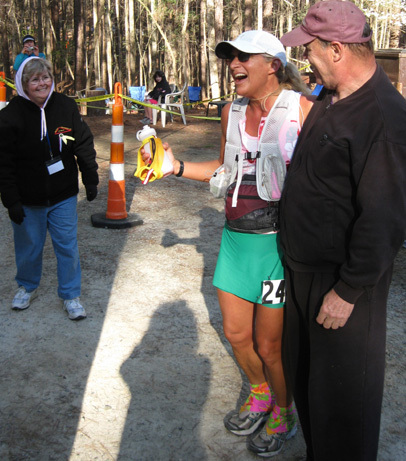 It's also fun to return repeatedly to all the applause and fully-stocked aid station at the end of each loop. 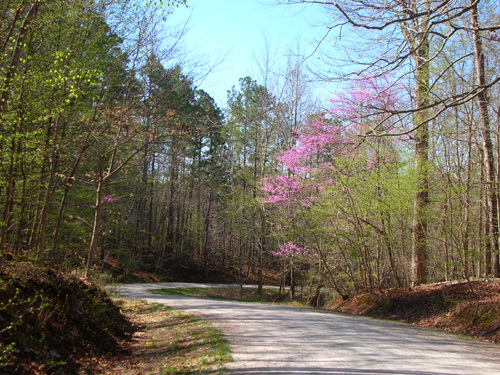 The timing in early April pretty much ensures the dogwoods, redbuds, and wisteria will be flowering along the course and the weather will be mild. This year's weather was probably the best in the race's history: sunny, breezy, with temps in the 50s to 70s F.
The cost is a very reasonable $140 before March 1 and $160 after that (pricey for 50 miles, but one of the cheaper 100-milers out there). Runners can get all but $20 refunded if they need to withdraw before March 1. A waiting list is maintained to fill those spots. I was surprised to learn that about two dozen expected runners failed to show up this year on race morning. That's pretty much inexcusable in a race that fills up in a matter of minutes and has extra runners on the wait list. 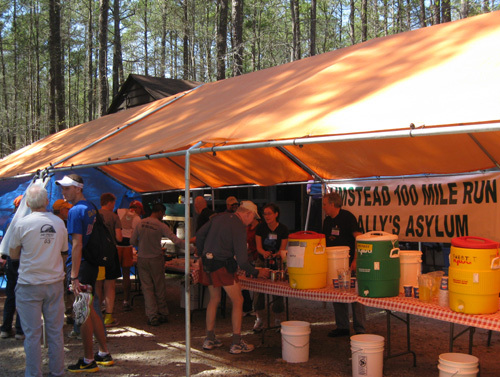 There are two well-stocked aid stations, additional unmanned water stops, a complimentary spaghetti dinner on Friday night, and breakfast both Saturday and Sunday mornings for each runner, volunteer, and one crew person. Extra crew are asked to donate $5 for each meal. The kitchen is staffed by volunteers from Friday afternoon until the race is over on Sunday. Volunteers manned a large outdoor grill on Saturday to prepare burgers and hot dogs. There is a variety of tasty food here. 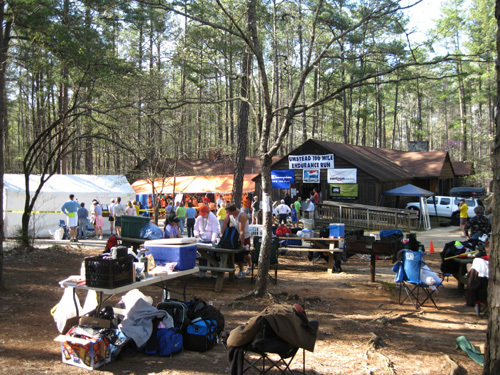 Runners also have a good variety of accommodations before and after the race, which is held at Umstead State Park. There are many motels and hotels in the Raleigh-Cary, NC area near the park, as well as campsites and rental cabins inside the park. Both times we have participated (the first was in 2007) we have stayed about three miles from the S/F area in the campground inside the park -- very handy before and after the race. First-time Umstead 100 finishers receive a handsome belt buckle, which you can see on the race's home page. One way the race saves costs is to award the buckle "free" only the first time a runners completes 100 miles. Buckles are offered for sale any subsequent times a runner finishes the race, rather than continuing to give them one each time. Who needs more than one from each different race anyway? Women have a choice of a buckle or pendant. All finishers receive a certificate suitable for framing and can purchase an acrylic award if they choose. Jim with Roanoke friend Dru Sexton. Jim is wearing his Umstead shirt. Each entrant received a gold-colored, short-sleeved Champion Double Dry synthetic running shirt (above) with the race logo and reflective piping. I like the design on the back. Instead of advertising, it has a course map. This is a good shirt to own when visibility is important. 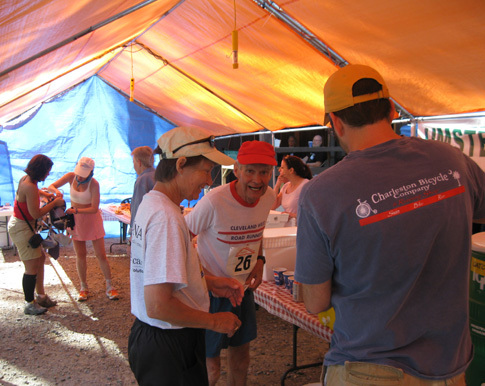 Runners also received a bright orange running hat embroidered with the race logo. The volunteers are enthusiastic, experienced, and very helpful. They and race management always get rave post-race reviews when the runners complete their race surveys or send thank-you letters to RD Blake Norwood (no relation to me) and his staff. This race also knows how to treat and retain volunteers. More about that later. Fortunately, this was easier than getting out of our back yard! 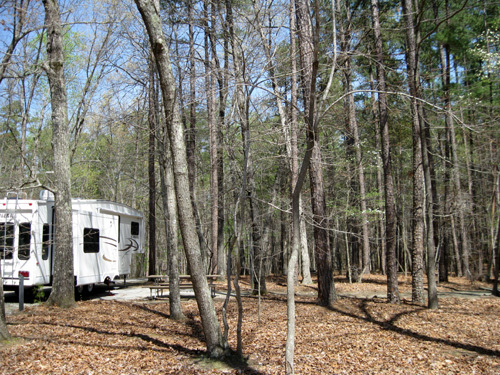 We pulled into the campground at Umstead SP a little after lunch and discovered that the three back-in sites suitable for our camper were already taken with other trailers. This early in the year they don't take reservations. We took the same site along the little loop road that we used two years ago. It's right across from a water pump and near the restrooms with showers. There are no electric, water, or sewer hookups; most people pitch tents in the 20+ sites. The cost is $15/night regardless of sleeping accommodations. 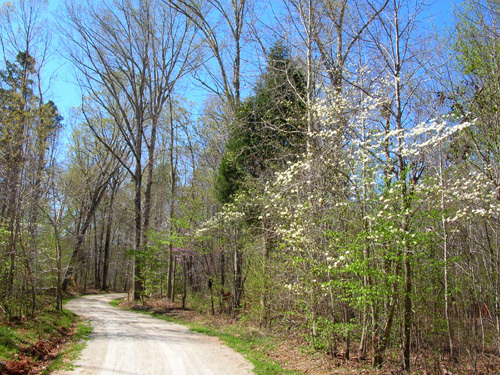 The sites are spacious, wooded, and popular on spring weekends. The campground was full by Friday night. In addition to all the dirt roads/trails the Umstead 100 uses in the park, there are many more miles of single-track trail that we've barely explored. One of those trails connects to the campground. I've gone out on it about a mile, but no further. We unhooked the camper and got it set up. During the afternoon Jim finished packing his drop boxes. We both laid out our clothing and supplies for the start of the race. Then we drove about three miles to Camp Lapihio, headquarters for the race. This is the site of the start, finish, turnaround after each loop, and main aid station. 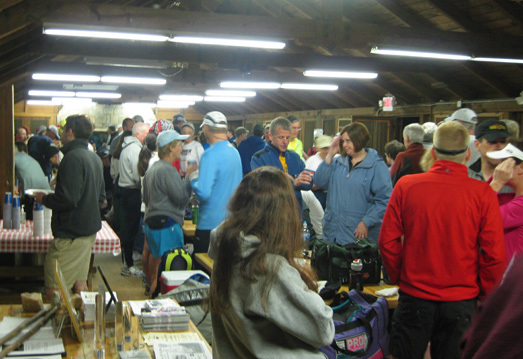 The lodge is the location for packet pickup, the pre-race briefing and spaghetti supper, runners' drop bags (if they want them inside instead of outside), and the post-race breakfast. While Jim checked in to run, I checked in with the volunteer coordinator. 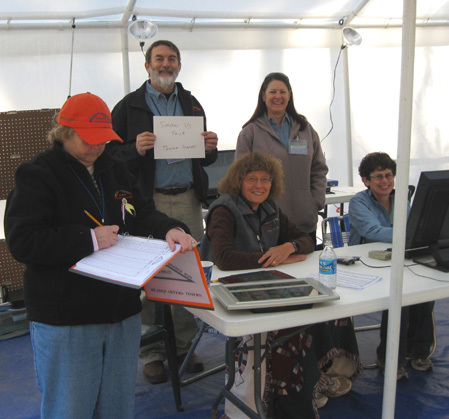 I worked in the timing tent on Saturday morning from 7 AM to 12:30 PM and sporadically during the afternoon to relieve other volunteers. 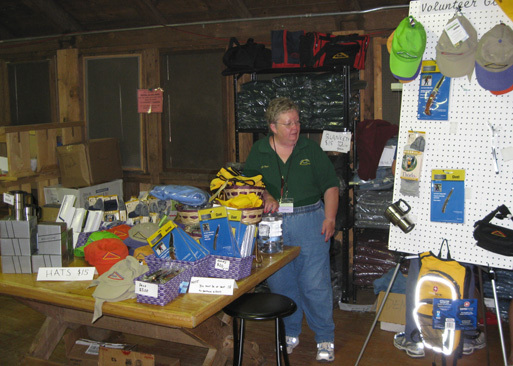 Volunteers are treated like royalty at Umstead. One of the perks is getting to choose from an amazing array of useful gifts -- many with the subtle race logo -- that was even better than when I worked the race in 2007: a dozen or more types of very nice running and casual clothes (technical shirts, denim shirts, hooded sweatshirts, a women's velour jackets, etc. ); wool Thorlo hiking socks; ball caps; caps with fabric sun flaps; bandanas; blankets; knives; a sturdy ice cream scoop; aluminum coffee mugs; compass devices; maps; reflective vests; a Swiss Gear hydration vest; duffel bags; and many other goodies Joe and Blake found. One of the best features of ultras is seeing old friends and making new ones. 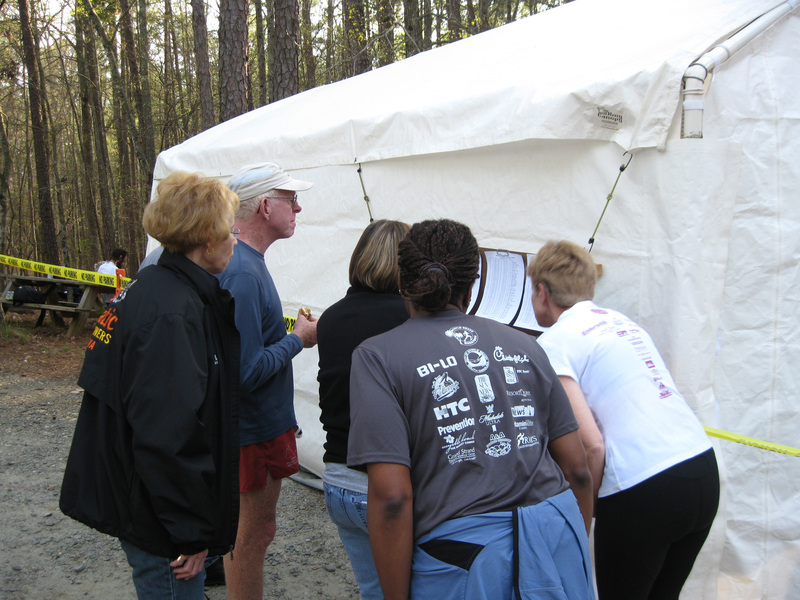 We know many of the folks who run, crew, pace, and volunteer at Umstead so we started socializing as soon as we got out of our truck! Two of our best friends are Hannah and Joe Lugiano, who handle timing duties before, during, and after the race. 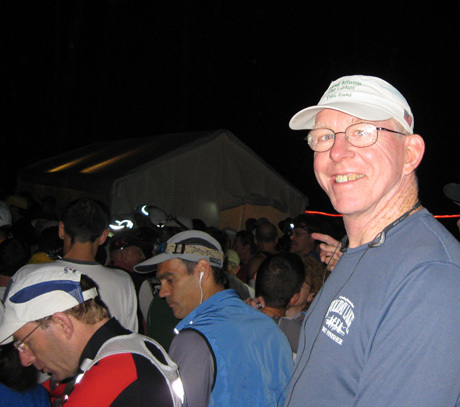 Joe is assistant RD and wears many hats, including handling registration, results, and race statistics. This year he didn't run in the race, so he was able to update the internet ultra running list every few hours with the standings. Joe got the best gig during the pre-race briefing, too. I'm sorry I didn't get a picture of his get-up: he had race numbers pinned all over his body and on his hat, in a demonstration of where NOT to wear your race number! It is very important for volunteers at the aid stations and in the main timing tent at the turnaround point each loop to be able to see the numbers. Even after Joe's graphic demonstration and pleas, however, we still had trouble seeing some of the numbers in the timing tent and had to ask runners what their numbers were. And that was the first morning, even before the runners were mentally spacing out or adding layers of clothes for the night! Matt and Anne Watts are at the near table, facing this way. Jim is on the right. After the briefing we enjoyed eating the delicious pasta dinner with our friends Anne and Matt Watts, catching up on their adventures since we saw them two months ago at Rocky. We're a bit envious of their plans to do a Rim-2-Rim-2-Rim run in the Grand Canyon in April, a feat that I shouldn't attempt again with my Granny knees. We'll see Anne and Matt again at some races we're all attending this year. After chatting with other friends we headed back to the camper so we could get a good night's sleep. The campground is very quiet at night . . . except when the airplanes are landing and taking off at nearby Raleigh-Durham International Airport! Oops. We forgot about that. Earplugs muffle the noise pretty well but not the vibrations. One advantage of staying inside the park is being able to sleep longer before the 6 AM start. We still needed to beat the crowd into the parking areas, however, so we were up before 5. All runners begin the race at 6AM even if they intend to run "only" 50 miles and not 100. 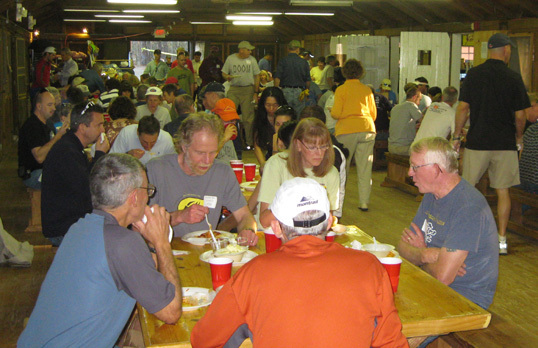 Most runners gathered and mingled inside the lodge (above) even though the temperature was a comfortable 52� F. at our camper when we left. 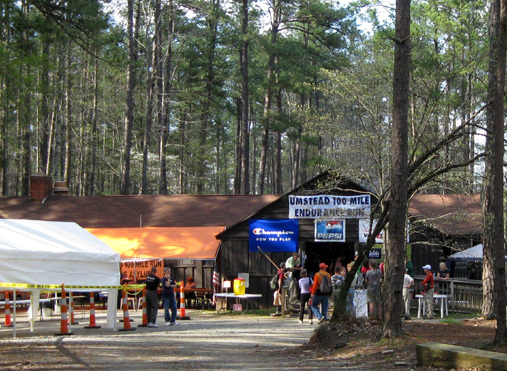 The weather was perhaps the best of any of the previous Umstead races: clear, mostly sunny, breezy, in the 50s both nights and low 70s during the day on Saturday. The great weather helped increase the finish rate this year. It was still dark at 6 but with about a three-quarters moon and lots of light-colored dirt roads, many runners didn't carry lights at the start of the race. 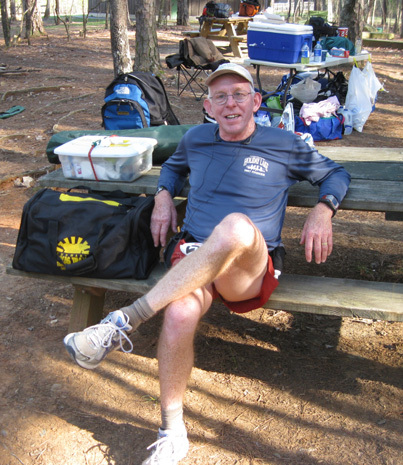 Although Jim packed his drop bags for 100 miles, in case he was having the race of his life, he was pretty casual about the whole thing and relaxed on race morning because the likelihood was that he'd be doing "only" 50 miles. He made pace charts for both distances and exceeded even the faster one for 50 miles. I was able to predict fairly well when he'd come in on each 12.5-mile loop based on his cumulative times. Morning timing crew: L-R, Hannah, Ron, me (bundled in a blanket), Joni, Norma. Joe took this photo of us. Joe and Ron have pretty much perfected the timing system for this race, although there are occasional glitches from EBCAC (Error Between Chair and Computer!!). Murphy's Lay rules, of course. Those glitches most often occurred when Joe or Ron were taking short meal or sleep breaks! I had a great view of the runners as they came up the hill toward us and have posted many of their pictures (and some of Joe) on our Picasa photo-sharing site. In this entry I'll include mainly photos of Jim. My view of runners approaching the timing tent at the top of a hill. 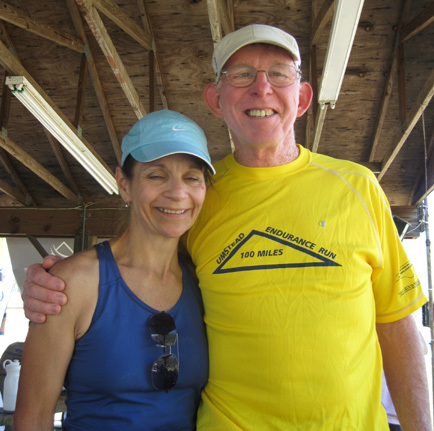 Jim's 100-mile pace chart was based on a 30-hour finish time, the maximum allowed. He figured out splits for a 14-hour 50-miler, allowing 16 hours for the second 50 miles. Of course, he really wanted to go faster than that, especially if he stopped at 50 miles. Based on his excellent training base and recent 50-mile times at Sunmart and Rocky, we figured he'd probably finish 50 miles between 11 and 12 hours. I was secretly hoping he'd keep going to 100 miles so I could pace him during the night but knew that a solid 50-miler would serve him just as well for his goal 100-milers at Bighorn in June and Tahoe Rim Trail in July. Terrific smile for the photographer! He came into the turnaround after the first loop in 2:36 hours (above), a reasonable 12:08/mile pace while he was fresh and the temperatures were still relatively cool. We both knew he'd slow down a little as the day warmed up and he got increasingly fatigued. He quickly got some food and fluids in the aid station and went out for his second loop. He used a combination of his own energy drink (Heed) and Hammergel, as well as Pepsi, ginger ale, and solid foods from the aid stations during the race. I was still in the timing tent when Jim came in after his second loop, which he ran in 2:49. That made his cumulative time 5:25 hours for 25 miles, an average 13:35/mile overall pace. He was still in good spirits and felt strong. It was close to lunch time and the temperatures were rising to the 70s by now. His feet were beginning to get sore from his Asics road shoes so he took a few minutes to change into his Asics trail shoes. He didn't get any blisters in this race, thanks to the shoe change, use of Injinji toe socks, and lots training miles to toughen up his feet. Still running up that hill after 37.5 miles! Volunteer Sally Squires applauds on the right. That shoe change added a few minutes to his third-loop split of 3 hours. His cumulative time for 37.5 miles was 8:25 hours, an overall pace of 14:07. I almost missed him coming in that loop. After my timing shift ended at 12:30 I got some lunch, talked to some friends who were volunteering and crewing, and went back to the camper to feed Cody and let him run around in the woods a little while. I got back to Camp Lapihio just before Jim came in at 2:25 PM (photo above). One hundred miles? What was I thinking?? The first thing he said to me was "one more loop," meaning he was going to stop after the next loop and not go for 100 miles. He had actually run the third loop faster than his official pace reflects (because of the time he spent in the aid station at the end of Loop 2) and the afternoon heat was getting to him. He had a fast turn-around and was back on the course for Loop 4. "Sally's Asylum," is named for volunteer extraordinaire Sally Squires, shown two photos above. That meant I didn't need to return to the camper again to get my pacing supplies in order. I hung around the turnaround aid station the rest of the afternoon, occasionally relieving timers who needed a break and socializing with crews and volunteers. Although the afternoon temperature may have been a bit warm for the runners, it was perfect for the rest of us. Done! Jim turns his GPS watch off at the end of 50 miles. Jim did his fourth and last 12.5-mile loop in 2:54 hours, finishing 50 miles in a good time of 11:19 at 5:19 PM -- just in time for a supper of freshly-grilled hot dogs and burgers! He loved those. By now we're both a little tired! It feels so gooooood to sit down! Jim savors a freshly-grilled hamburger while checking the latest posted race standings. We hung around the lodge area talking with friends for half an hour before heading back to the camper so Jim could get cleaned up and relax. I enjoyed hearing all his race stories as I ate my supper (I don't care for hot dogs and burgers), reorganized our clothes and supplies, and got stuff cleaned up. We both slept like logs that night. The runners who were still out on the course were treated to a clear, starry, fairly warm North Carolina night and a beautiful sunrise on Sunday morning. We returned to the finish area about 8:30 AM on Sunday to watch some of the runners come in who had been out on the course for 26+ hours. We just missed seeing our friend Anne Watts finish in 26:41 but had lots of time to chat with her and hubby Matt (who finished in 22:29) as they ate breakfast and relaxed in the lodge. We were glad they didn't have to leave right away to return to Colorado, as they did after ATY and Rocky. and RD Blake Wood share in her victory over the distance. We meandered outside from time to time and caught the happy finishes of several other friends: Yen Nguyen, Kim Love-Ottobre, Bill Gentry, Kim Sergeant, George Nelson, Angela Ivory, Rob Apple, and Susan Donnelly. I think the happiest of our friends was Francesca (Frankie) Stone, above, who finished her first 100-miler in a fine time of 27:06 after persevering through some problems during the night. She had a great smile on her face at the end. We met Frankie at Rocky in February and we'll see her again at Tahoe Rim Trail, which is close to her home in California. This time we also had the pleasure of meeting her husband, who is a professional photographer for several magazines. I put photos of most of these folks on our Picasa site. There are lots of photos of the course in the 2007 Umstead album at that site. Jim kids around with Bill Heldenbrand on Sunday morning. Bill paced Frankie during the night. 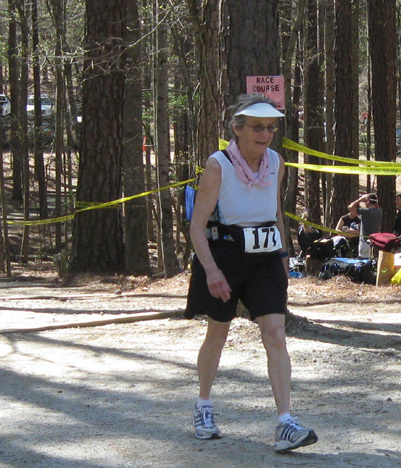 74-year-old Barbara Macklow after 37.5 miles. She finished the whole shebang!! 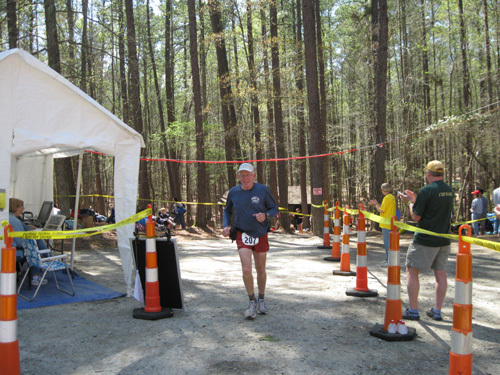 Another outstanding performance by an older runner was 80-year-old Leo Lightener's 75 miles. I talked with him Sunday morning for several minutes. What a sweet man and wonderful role model for us young(er) punks! He was disappointed that his back caused him problems and he wasn't able to complete the entire race, but my gosh, according to posts to the internet ultra list after the race Leo's ~100K split of 17:17 may be the fastest 100K by a person 80+. That time was for 62.5 miles, a bit farther than 100K. His time at 75 miles was 21:35 when he dropped out, unable to walk or run straight because of his back. He got credit for the 50-miler. 80-year-old Leo Lightener, in red cap, gets aid after 37.5 miles. One hundred thirty-two of 248 runners hung on to complete the full 100 miles, finishing anywhere from 15:05:10 (31-year-old Dave James) to 29:54:41. Imagine running 100 miles at a 9:03/mile pace, including all stops. That was a record number of 100-mile finishers in the race's 15-year history. Two women also had stellar races, both beating the previous female record: Jill Perry, age 38, in a speedy 16:02:37 (a 9:37/mile pace) and 43-year-old (first female masters) Kris Whorton just three minutes behind her. They placed third and fourth overall. 'Way to go, ladies! As I said near the beginning of this entry, Umstead is a good course for fast runners, first-time attempts at 100 miles, and PRs at that distance. This year the race had 43 first-time finishers and 21 PRs. 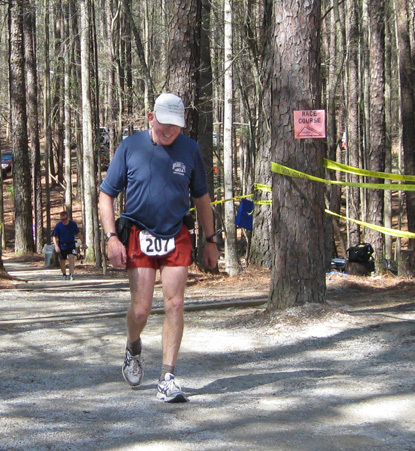 Our friend Fred "Doom" Dummar, for example, was delighted to set a new personal record of 20:24 at Umstead this year. To illustrate how competitive his M40-49 age group is, he was 20th overall -- and "only" 8th in that age group! I think he was too happy about his time to care much about his placement. Crews enjoyed the warm sunshine as they hung out near the headquarters on Saturday. You can see full results, splits, and various other detailed race stats on the race website. Joe's stats are VERY complete! 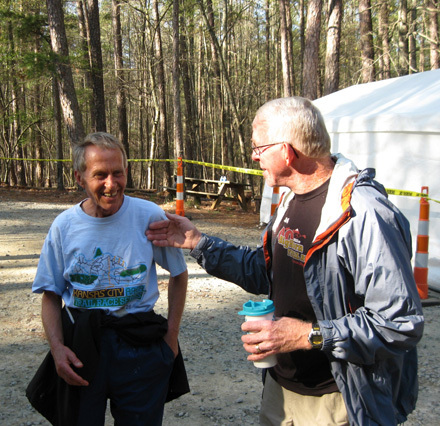 Jim's next race is David Horton's Promise Land 50K++ in our Blue Ridge Mountain "back yard." It is close enough from our house to train there. This will be the fourth time Jim's run the race and about the umpteenth time he's been on the course. He and Roanoke friend Steve Bowles plan to do several long training runs on the course in the next three weeks. I don't know if I'll train up there or not. I do need to get some hill training for my next race, which is the Bighorn 50K in Wyoming in June, but I have to limit the number of miles I run on steep terrain now (losing knee cartilage as I write!). NOTE: Jim wrote an entry about extending the life of his Garmin 305 GPS watch batteries so they'll last long enough to use in a 100-miler. The same technology can be used with the 205 model (not sure about the 405). You can find the link here and on the topics page in the April entries. It's not linked to this entry.